Two colorful cargo train puzzles: one teaching colors and one teaching shapes. Each giant puzzle features very bright and colorful illustrations that encourage parent-child discussion about the pictured objects. Each giant puzzle has 30 puzzle pieces (60 pieces total) and each puzzle measures 5-foot long (10-feet total)! 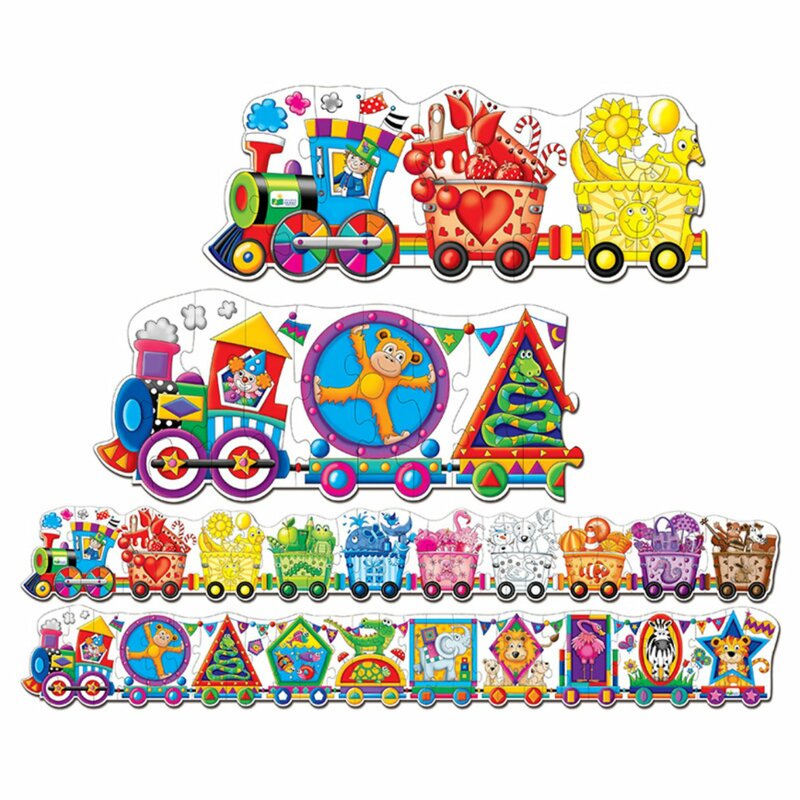 EXPLORE COLORS– One giant train puzzle aims to help your child learn about colors; each train carriage introduces a new color, helping your child to learn to recognize and differentiate between colors with a range of bright illustrations. EXPLORE SHAPES - The second puzzle teaches about shapes, helping your child to develop early mathematical concepts such as shape recognition. Each shape is illustrated beautifully with fun animal characters. ENCOURAGE FOCUS & PERSEVERANCE – The giant train puzzles are shaped in such a way as to motivate the child to persevere and focus until the task is complete. By adding carriages to the end of the train, the child's excitement and enthusiasm build up as they progress – each puzzle is an incredible 5 foot long! PROMOTE CONVERSATIONAL SKILLS – The fun themes are designed to get your child talking – chat about the animal characters, where the train might be going and enjoy the images together to encourage better conversational and socialization skills. BOOST CONFIDENCE – These giant puzzles are a great way to build confidence and boost self-esteem; by adding one piece at a time to the end of the long puzzles, the child can create a masterpiece of fantastically fun imagery; a huge achievement for any child!